Exterior lighting fixtures are a relatively quick and easy way to raise your home value. Both practical and beautiful, outdoor lights make your house safer. If placed properly by a well-trained electrician, they can highlight your house with an air of sophistication and romance. Potential buyers will notice your well-placed outdoor lights. An electrician can install outdoor lighting fixtures, like porch lights, deck lights, and garden lights, within a day. Your home will look newer and more appealing during the day and at night. Ambient light just might be the ticket to a sale above your home's value. Recessed Deck Lights: Recessed deck lights are costly, but they are a worthwhile investment that will add mega curb appeal. If you want to light up your deck without making a visual impact, recessed deck lights are both unobtrusive and functional. These fixtures, which sit flush on the surface of your deck, are made of strong plastics and handle foot traffic well. Deck Post Caps: Adding light fixtures to the top of your railing posts is a way to increase home value. These outdoor lights offer a decorative edge in the daytime, and a subtle, romantic source of light at night. 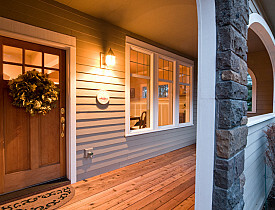 Deck post cap lights exist in a variety of materials and styles. Deck Post Lights: These are lights that are actually embedded in the sides of your deck posts. Lighting the bottoms of your posts is a creative way to light up your deck and increase house value. You can install lights that are recessed into the posts or are mounted on the surface. Deck Lanterns: If your deck is covered, consider hanging lanterns from the ceiling. Hanging outdoor lights can enhance the style of your home and improve home value. Gone are the days of clunky patio lights; the variety of modern and sleek hanging deck lights, from tiny LED lights to designer stainless steel, will complement even the most modern home design. Solar lights are revolutionizing residential landscape lighting. It is a green way to increase home value. Time was, setting up outside lighting involved digging trenches and installing wires, on top of boosting your electric bill. Solar lighting is portable and requires no infrastructure because each light has its own photovoltaic cell. The photovoltaic cell absorbs sun during the day, which it stores in a battery. At night, the light draws power from the battery. You can install solar landscape lighting yourself.